Fleet idling can be a big drain on your profits. And it has an incremental environmental impact as well. Idling wastes fuel and increase vehicle maintenance costs. Idling is also a bit misunderstood – We tend to over-idle even when most diesel engine manufacturers recommend maximum of three minutes of idling for warm up. Idling longer than the prescribed time can actually cause engine damage. We also know that you as Fleet Managers are under pressure to drive out unnecessary costs. But, in order to reduce costs, you need to know exactly what is driving the cost. Connected Vehicles offer the necessary information to help you make informed decisions especially when it comes unnecessary idling. We help identify the fleet idling whether your vehicle is in your own yard, at customer stops, drop off locations. We offer custom reports that show you monthly and weekly trends for idling by drivers, vehicles, and locations, so you can take corrective action. Connected Vehicles can help reduce your overall fleet costs by reducing unnecessary idling. 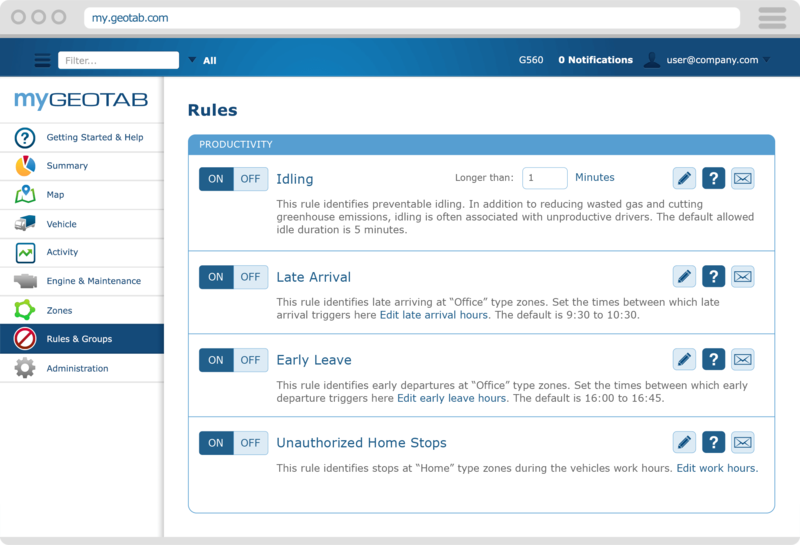 You can set up an idling rules in MyGeotab software and then be notified based on exception to those rules. You will be able to easily identify drivers who might be idling for any non-business purpose (e.g. if there is no PTO engaged) or if they idle for longer than five minutes or any other exception you like. Book your custom report demo or learn more about MyGeotab reporting solutions. Telematics data, reporting and analysis, and driver coaching all play a role in creating more profitable, sustainable and efficient fleets. We have just added eight new custom fleet management reports from Geotab. These reports provide you with more actionable data to help you make better business decisions. To reduce the idling occurrences even more, you can use Geotab’s GO TALK in-cab device as an Add-On so you can deliver a spoken text-to-speech message to your drivers. You can now offer immediate feedback and coaching to driver, instead of waiting to look at reports. Please feel free to share your ideas on how you manage the excessive idling in your fleet.